A Pita Pit restaurant has opened in the Publix shopping center in Niceville. Pita Pit serves lean grilled meats, cheeses, fresh vegetables, exotic toppings and signature sauces which are then wrapped up in a steamed white or wheat pita or served as a fresh salad. According to its website, Pita Pit was founded on the premise that people want an exciting alternative to fast-food restaurants; a place with healthy, great tasting food served fresh, yet still fast. Pita Pit features its own special light pita aimed health-conscious consumers. Pitas are made fresh and customers can customize their pitas exactly to their liking. The Niceville location is open 10 a.m. to 9 p.m. seven days a week. The first Pita Pit was opened in 1995, in Kingston, Ontario, Canada, with a vision to provide a healthy alternative to fast food restaurants. Today, there are over 500 Pita Pit restaurants in 11 countries. In the US, there are over 220 Pita Pit restaurants in 43 states. Both Pensacola and Panama City have Pita Pit restaurants. The local Pita Pit is owned and operated by Steve Hendrix. It is located at 1552 John Sims Parkway, next to Marco’s Pizza. 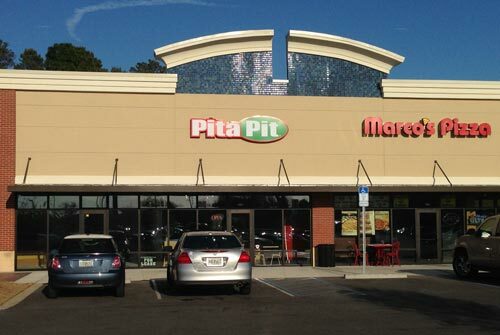 The Niceville Pita Pit is located at 1552 John Sims Parkway, next to Marco’s Pizza in the Publix shopping center.